These Irish crystal goblets from Galway Crystal are enhanced with the Celtic Trinity knot. 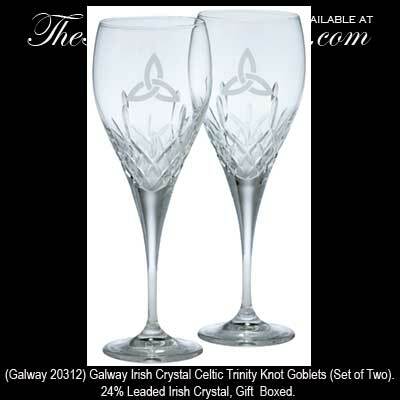 Galway Crystal presents a beautiful pair of 24% leaded crystal goblets with the Trinity knot etched on the glasses. These Irish goblets measure 9 1/4" tall and are typically used for water, but may also be used for wine. The Irish crystal goblets are gift boxed with the Celtic knot history and are from Galway, Ireland. An ancient Celtic symbol, also known as the Triquetra, the Trinity Knot has many spiritual meanings, most popular being Spirit, Mind and Body. It frequently appears in many ancient manuscripts such as the Book of Kells.